Max Ash started with a simple idea — “I like basketball and hot chocolate” — to make a mug designed for throwing marshmallows into the drink. 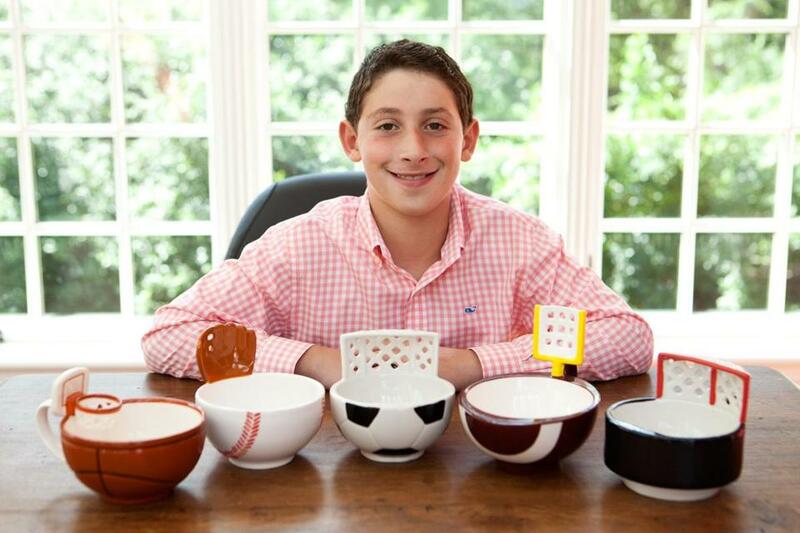 Max Ash’s family didn’t expect one of his elementary school art projects — a mug with a mini basketball hoop attached for throwing marshmallows into hot chocolate — to grow into a profitable business. The clay creation, his parents thought, was simply a whimsical idea by a little boy with dyslexia, a learning disability they credit with making him a creative thinker. Ash, who lives in Weston and will be a fifth-grader at the Carroll School in Waltham, created his mug when he was 8. He presented his idea to the Blank Center for Entrepreneurship at Babson College, and then in a pitch contest at Fenway Park. That led him to launch a crowdfunding campaign that raised $6,000, which he used to help make and sell a small batch of mugs online. Ash’s break came when the online retailer UncommonGoods placed a large order and the mugs were a surprise hit. His mugs are now carried by companies including Hammacher Schlemmer, Nordstrom, The Grommet, and even the Basketball Hall of Fame. Last holiday season, he sold more than 18,000 of them, said his mother, Jennifer Ash. Ash has also expanded his line of mugs to include baseball (“The Mug with a Glove”) and football (“The Mug with a Goalpost”), and a soccer and hockey version are scheduled to arrive in stores in October. 5 percent of his profits to dyslexia organizations and other nonprofits, and she hopes his company, MAX’IS Creations (Max came up with the spelling), will help pay for college. Sacha Pfeiffer can be reached at pfeiffer@globe.com.